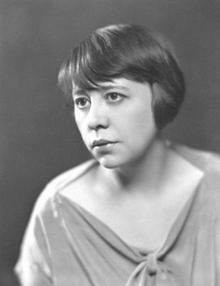 Zoe Byrd Akins (October 30, 1886 – October 29, 1958) was an American playwright, poet, and author. She won a Pulitzer Prize for drama. Zoe Byrd Akins was born in Humansville, Missouri, second of three children of Thomas Jasper and Sarah Elizabeth Green Akins. Her family was heavily involved with the Missouri Republican Party, and for several years her father served as the state party chairman. Through her mother, Zoe Akins was related to prominent figures like George Washington and Duff Green. Her family moved to St. Louis, Missouri when Zoe was in her early teens. She was sent to Monticello Seminary in nearby Godfrey, Illinois for her education and later Hosmer Hall preparatory school in St. Louis. While at Hosmer Hall she was a classmate of poet Sara Teasdale, both graduating with the Class of 1903. It was at Monticello Seminary that Akins wrote her first play, a parody of a Greek tragedy. Following graduation Akins began writing a series of plays, poetry and criticism for various magazines and newspapers as well as occasional acting roles in St. Louis area theatre productions. In the early 1930s, Akins became more active in film, writing several screenplays as well as continuing to sell the rights to plays such as The Greeks Had a Word for It (1930), which was adapted for the movies three times, in 1932 (as The Greeks Had a Word for Them), 1938 (as Three Blind Mice), and 1953 (How to Marry a Millionaire). Two highlights of this period were the films Sarah and Son (1930) and Morning Glory (1933), the latter remade as Stage Struck. Both films earned their respective female leads (Ruth Chatterton and Katharine Hepburn) Academy Award nominations for Best Actress (Hepburn won). In 1935, she was awarded the Pulitzer Prize for Drama for her dramatization of Edith Wharton's The Old Maid, a melodrama set in New York City and written in five episodes stretching across time from 1839 to 1854. The play was adapted for a 1939 film starring Bette Davis. In 1936, Akins co-wrote the screenplay for Camille, adapted from Alexandre Dumas's play and novel, La dame aux camélias The film starred Greta Garbo, Robert Taylor, and Lionel Barrymore, and earned Garbo her third Oscar nomination. Despite the fame afforded her, Akins didn't pursue a screenwriting career beyond her early successes. In 1932, she married Hugo Rumbold (in the last year of his life) and, after several Hollywood films, she returned to writing plays and spending time with her family. She was rumoured to be in a long-term relationship with Jobyna Howland until Howland's death in 1936. According to Anita Loos, the two squabbled often, "But such gibes actually held the key to their devotion." She was the great-aunt of actress Laurie Metcalf. She lived for a short time in Morrisonville, Illinois. Akins died in her sleep on the eve of her 72nd birthday in Los Angeles. ^ Dictionary of Missouri-Biography, Lawrence O. Christensen, University of Missouri Press, 1999. ^ "Zoe Akins Arrives", The New York Times, October 12, 1919. ^ H.L. Mencken, My Life as Author and Editor, p. 267. ^ "Modern Drama; Plays by Miss Akins and Mr. Howard in New Series", The New York Times, April 26, 1914. ^ "The Play: Vine Leaves in a Heap" by J. Brooks Atkinson. The New York Times September 26, 1930. ^ "Zoe Akins to Be Wed to Hugo Rumbold" The New York Times, March 8, 1932. ^ Anita Loos, The Talmadge Girls, p. 98. Wikimedia Commons has media related to Zoe Akins.